Every parent needs to talk to their child about finances before college applications are submitted. First, get the conversation started by going to FAFSA4Caster to calculate your Expected Family Contribution (EFC). Second, google the name of the school your child is considering and the words “Net Price Calculator”. Every school provides one, and it will give you a more accurate picture of the school’s actual cost. Third, sit down with your child and research the colleges they plan to apply to. Look in particular for possible scholarships that might help offset that cost. Now is the time to be clear with your student whether you will pay for their education in its entirety or make a contribution to their college costs. When should you begin this conversation? The earlier the better! Ready to get started? Parents, congratulations on diligently saving and planning for your child’s education. Your investment tells your child that higher education is important and critical to success in the workplace. That is why you saved for it. Although you have set aside money to pay or help pay for your child’s education, the cost of higher education has increased significantly in recent years and suddenly your child’s dream school may seem out of reach. As the time draws near, you’re not sure if it is enough and you are hoping for a lot of scholarship money. It is time to have a conversation with your child about what you are able to contribute and how your child might participate. Start by working together to compare the costs of each institution and to explore how a college education will be funded. A little research goes a long way toward helping everyone see how higher education is funded. Here are eight crucial tools and topics to help you begin the conversation. 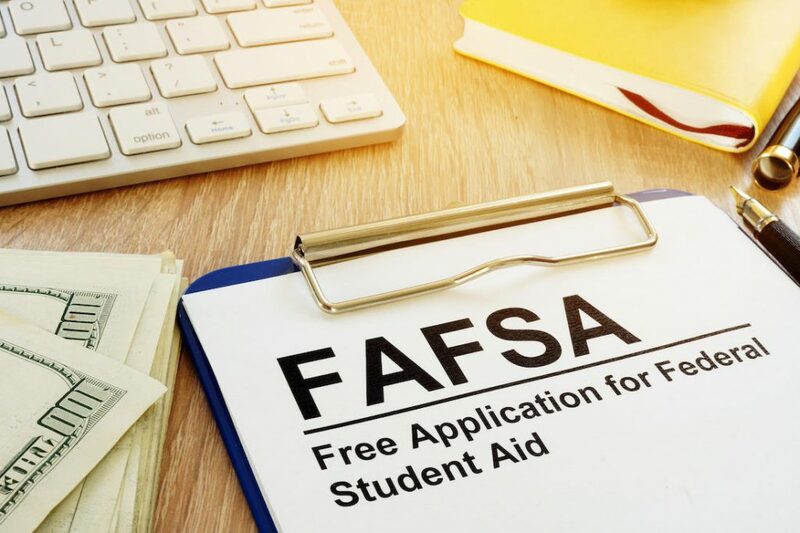 The Free Application for Federal Student Aid, better known as FAFSA, is required by nearly all schools for students receiving federal, grants, loans, incoming merit scholarships for freshman, or participating in work study. The FAFSA can be found at www.FAFSA.ed.gov Please note the extension – .gov. When you search for FAFSA, imitation sites offering to complete your free application for a fee may pop up with .com extensions. FAFSA becomes available on October 1 of a student’s high school senior year, but you may establish a FAFSA ID at https://fsaid.ed.gov/npas/index.htm before that date. You may also complete the information on www.FAFSA4Caster.gov at any time and the results will give you an Estimated Family Contribution (EFC) and can help you know whether or not your child will be considered for financial aid based on need. After you complete the FAFSA, the school will generate a letter outlining your financial aid package which includes federal student grants, federal student work study, and loans. Be careful not to complete the FAFSA before October 1 of the senior year. The exception to this rule is if your student begins college in the summer in which case the FAFSA for the current school year must be completed. If you have another child in college at the same time, you should update that FAFSA first and then transfer the information into a new FAFSA for the rising college student. Each school will note a financial aid deadline for providing a completed FAFSA and CSS Profile (if applicable). If you think your child may qualify for financial aid, adhere to the financial aid deadline. After submitting these financial applications, be sure to monitor your student’s college email for additional requests from the financial aid offices. Students who attend college in the state of Florida and who have met certain requirements will receive the Bright Futures Scholarship. The application opens in October of the senior year. Go to this site to determine the Bright Futures Scholarship level for which your child qualifies: http://www.floridastudentfinancialaid.org/SSFAD/bf/ and remember, each year the legislature re-evaluates the amount the scholarship will pay toward tuition as well as the requirements. As your child’s acceptance letters are received, many will include the offer of an “Incoming Freshman Scholarship”. These scholarships are based on merit and awarded to incoming freshman only as an enticement for the student to select that school. Your child can maximize merit aid by applying to schools that are a good fit for your child and where your child falls in the upper quartile, preferably in the upper 10 percent, of that school’s academic range. Study carefully the merit aid award details. Is it a one-time award or a recurring award requiring the student to maintain a minimum GPA? Which courses should you take the college credit? An important factor with financial consequences to consider is the college credit your student might receive for the advanced studies they have taken in high school. Check each school’s site to see if they award college credit for test scores on Advanced Placement and International Baccalaureate examinations and/or college “dual enrollment” courses taken while in high school. Should you take college credit for every subject? Not necessarily. Consider retaking a course for which you have earned college credit if it is a subject important to your college major. For example, if you are pursuing engineering and received a 5 on your AP Calculus class we recommend you take that course again in college. Depending on the degree your child is seeking, it may be possible to graduate in less than four years. Some colleges and universities are offering this option, or your student can work toward early graduation by taking an extra class or two each semester. Some students begin their education by first attending community college and then transferring to a four year institution. College students may continue to research and apply for available scholarships. This is the hard part. The earlier you have this conversation the better. We recommend the beginning of the freshman year, if not sooner, and that the conversation should include how much good grades and test scores will mean for merit-based scholarships for incoming freshman. One way to initiate the conversation is to acknowledge the beginning of high school with a first official college tour. Register for a campus visit and make an appointment with an admissions counselor. When you arrive at the admission office introduce yourself and your child by saying that your son/daughter is just starting high school with college in mind. 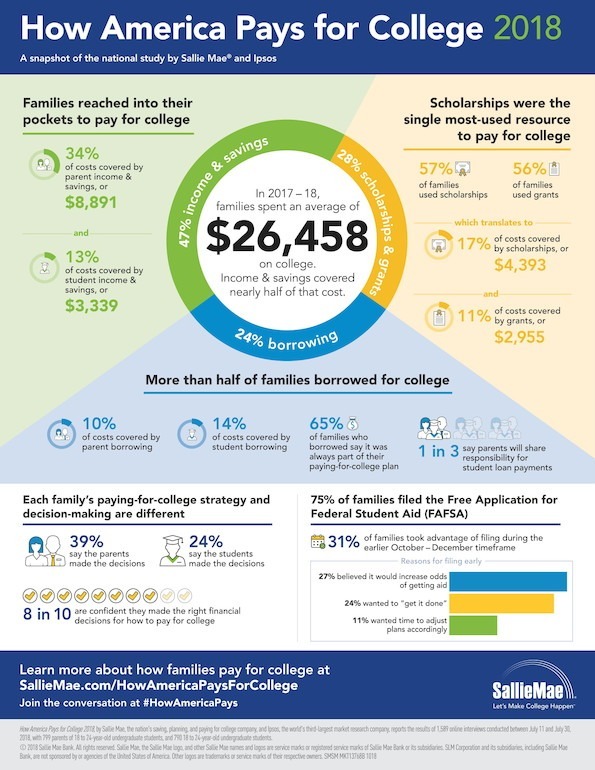 Ask them to give an overview of college costs and information about incoming merit-based freshman scholarships your child can work toward while in high school. Now you have a launching pad for a follow-up conversation with your child! Be honest about the amount of money you can contribute. It is helpful to show your child the investments you have made, i.e., your 529 plan, a pre-paid plan or other savings. Many college students work while in college, often gaining experience in their fields of study, while honing their time management skills. Some colleges have well-developed co-operative programs that provide well-paid work experience in the student’s field and often lead to the student’s first job after college. 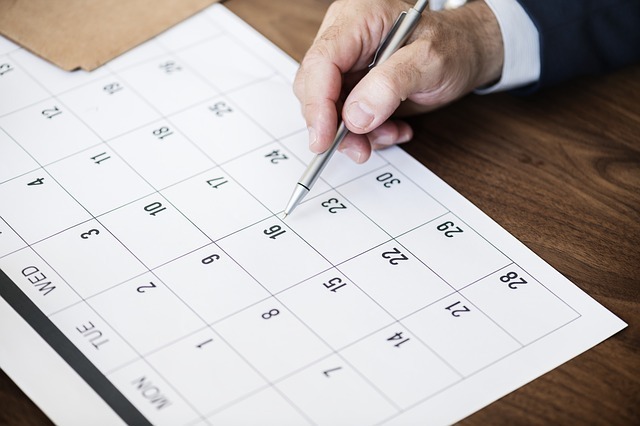 Work study programs keep your child on campus and tend to be more attuned to the testing calendar than off-campus jobs. This adage is still true: We tend to value most what we have worked for the hardest. 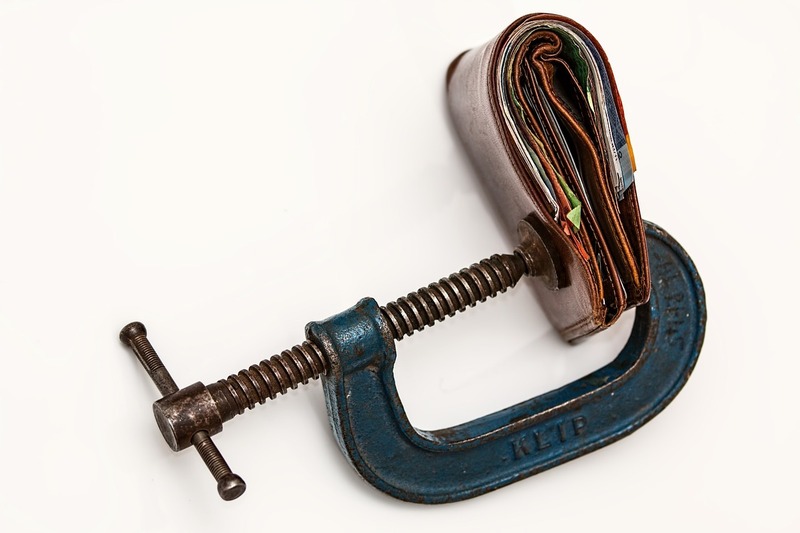 The national student debt now exceeds our collective credit card debt. This can be a paralyzing burden for young professionals eager to start their life after college. 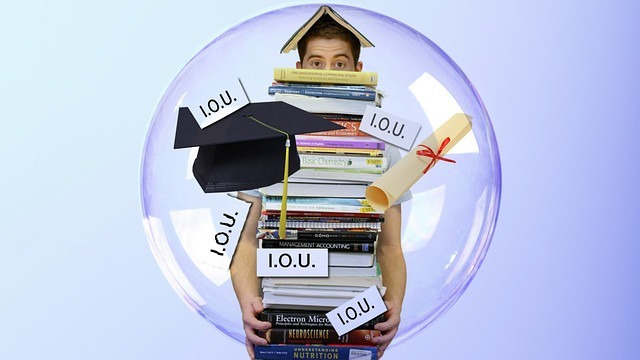 Now is a good time to determine if graduating debt free is a goal you and your child value. If taking on student debt is necessary, then how much is acceptable? A good rule of thumb is to limit student debt to the expected annual salary of your first job after college. You’ve done your research, collected the necessary data, and taken the time to talk to your child about the options. You can feel good that you have taken an approach based on real numbers that allows you an opportunity to teach your child how to make an important financial decision in the spring of the senior year. That’s when you have acceptance offers in hand and financial packages from each school that offer a wide range of options including merit-based incoming freshman scholarships, Bright Futures Scholarships, work study or co-op programs or student loans and comparisons to in state and out of state tuition.